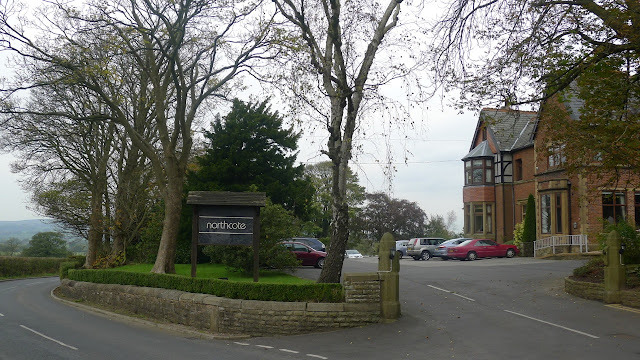 For foodies throughout Britain, Northcote Manor needs no introduction - but for those that are interested in such details: In the mid eighties, Chef Nigel Haworth and General Manager Craig Bancroft took up posts at the ambitious hotel and restaurant. By 1986 their combined efforts led to Michelin awarding Northcote its first star. 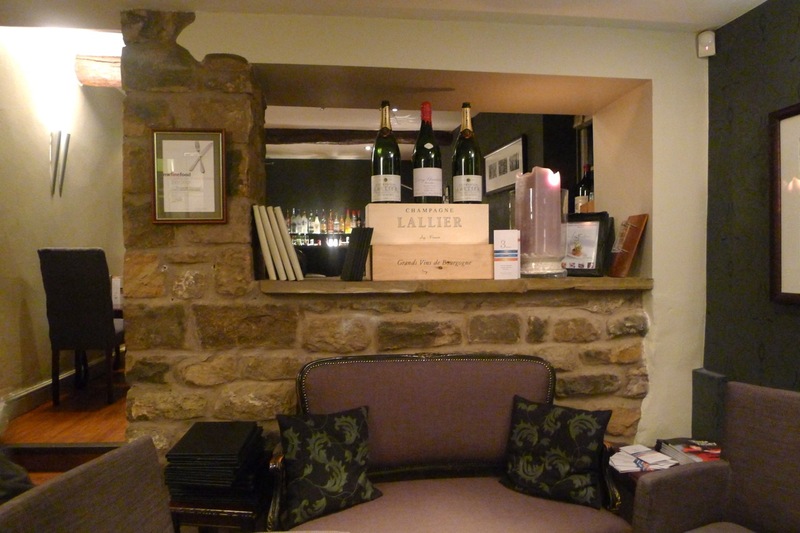 In 1989 the pair became joint owners and have worked hard to consistently place the Manor as one of the best places to stay and dine in the country; retaining its star throughout. 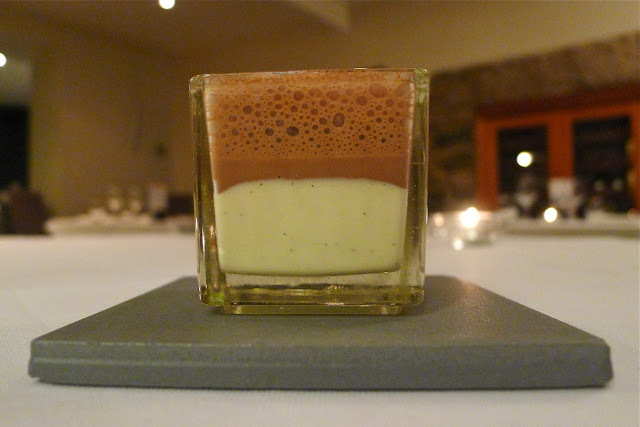 In 2000, young local lass Lisa Allen joined the kitchen, expecting to stay for one or two years, gaining experience before moving on. 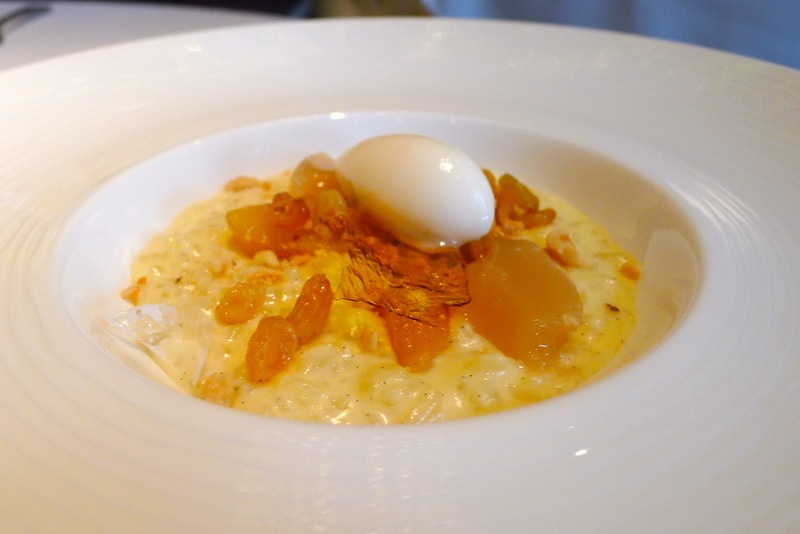 However in 2003, impressing Nigel and having been taken under his wing Lisa was made Head Chef - this along with her successful appearances on Great British Menu make her one of the most recognisable, respected and celebrated female chefs on the country. Typically idiosyncratic Lennon and McCartney lyrics from the Beatles’ A Day in the Life - supposedly penned after reading a newspaper article about the state of Blackburn’s roads. On the day in our lives that my wife, my parents and I chose to visit, the roads were fine. 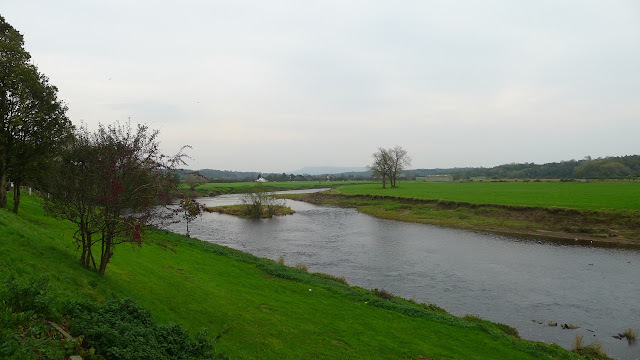 We enjoyed our journey up from Cheshire to the beautiful Lancashire countryside. 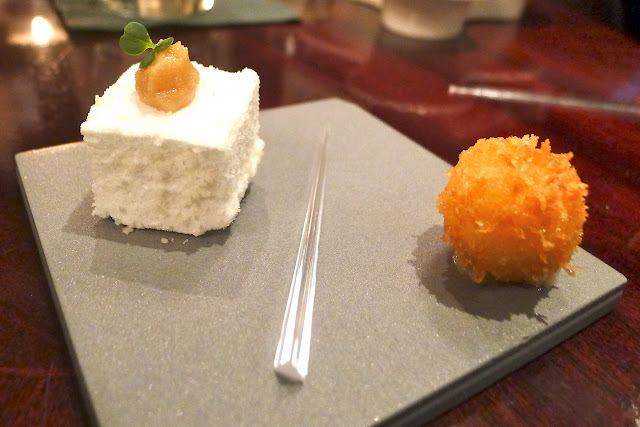 The only holes being the big ones in our bellies, eagerly waiting to be filled by Northcote’s Michelin starred cuisine. The Victorian manor house boasts fantastic views of the Lancashire countryside, overlooking the River Ribble. As the hills roll away, sheep and cattle gently graze on the lush greenery. No wonder Nigel’s locally sourced ingredients taste so good with such luscious surroundings for them to thrive. 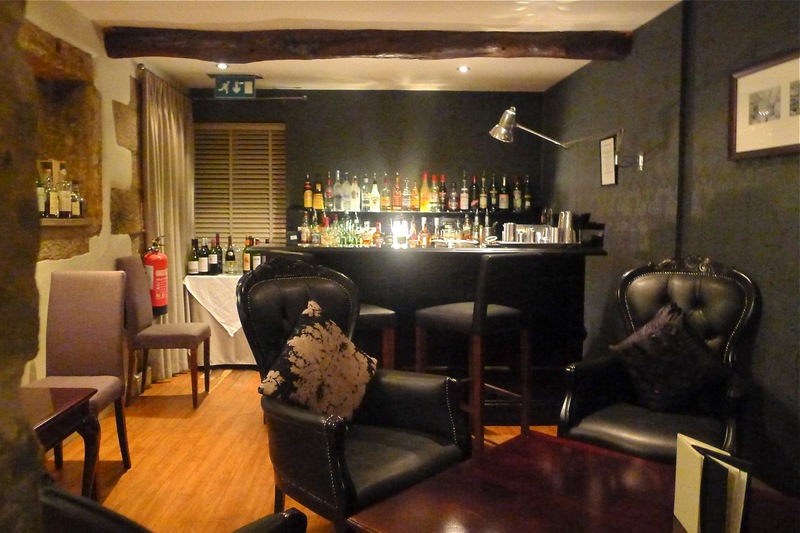 Once inside, stresses roll away as one is welcomed into the grandiose bar and lounge area. 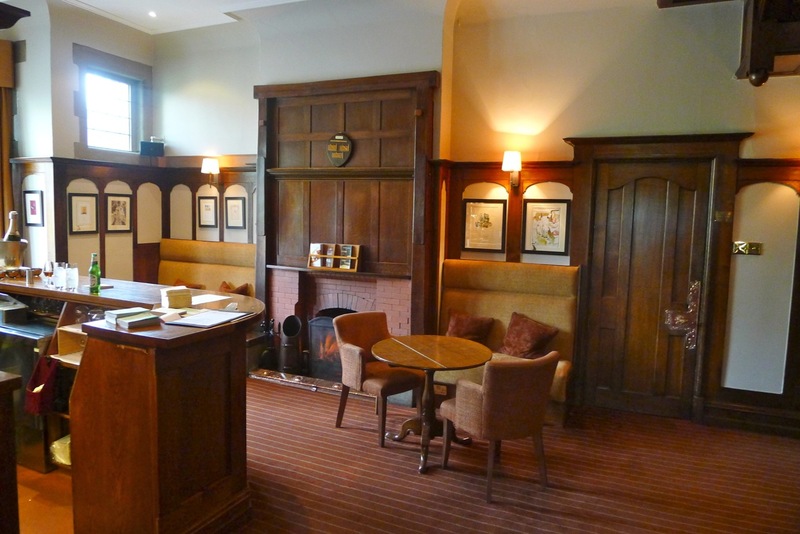 The quintessential Britishness of places such as Northcote Manor (Holbeck Ghyll and the Box Tree in Ilkley, among the others) is as heartwarming as the open fire that cheers visitors on the colder days in the hills. The oak paneling and antique decorations are impressive enough, but what really impresses a foodie like myself is the remarkable collection of framed menus from some incredible restaurants; including Marco Pierre White’s Harvey’s and The Canteen; Pierre Koffmann’s three-starred La Tante Claire; The Box Tree from it’s two star heyday and some place called La Pyramide. 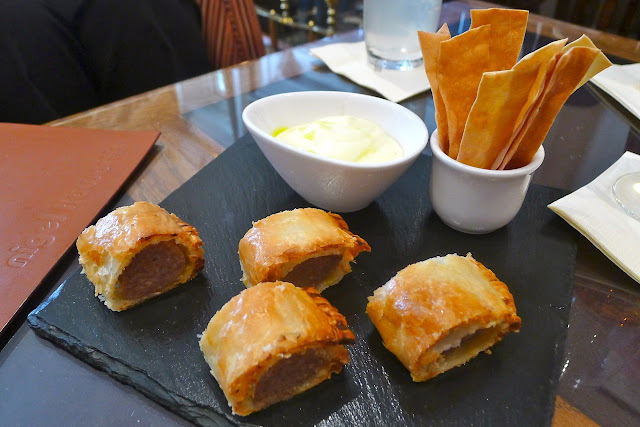 As we enjoyed our aperitif, an amuse bouche featuring a Caramalised Onion Mousse with Flatbreads and my dad’s favourite, Sausage Rolls soon arrived. It’s wonderful to see something as simple (albeit perfect) sausage roll served up in a Michelin eatery and it reminds diners of Nigel’s no nonsense approach to good quality, hearty food. 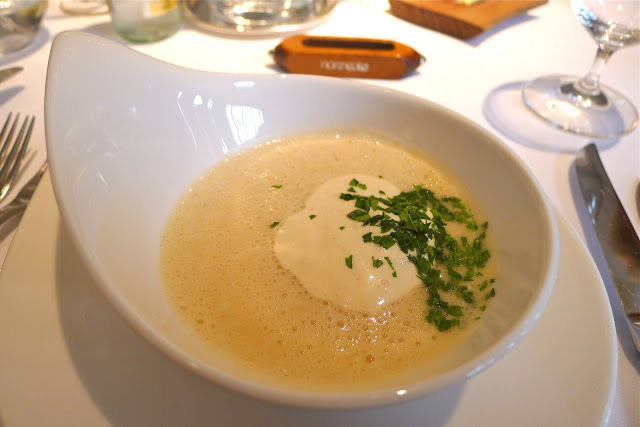 Taking our seats in the main dining room, we eagerly awaited the set starter, a Parsnip Soup with Curry Foam. Although the main dining room features more modern décor than the reception rooms, the neutral colours and beautifully set tables still maintains its classic splendor. 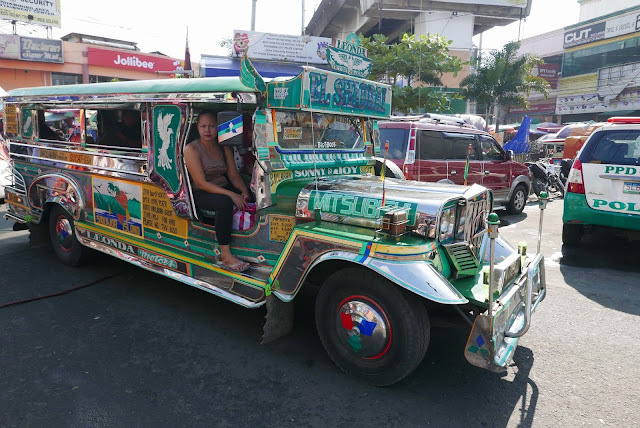 The plush leather seats were terrifically comfortable. 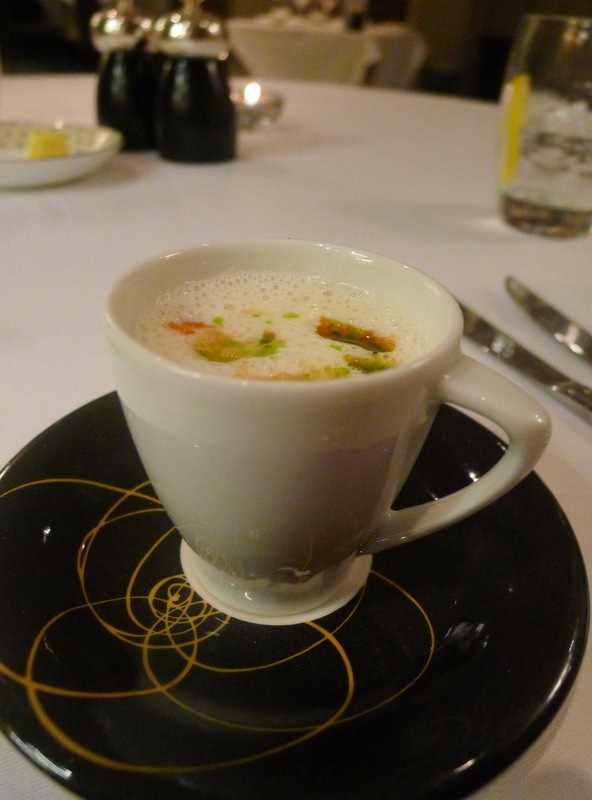 The soup was very good; the accompanying Lancashire Cheese bread was outstanding. 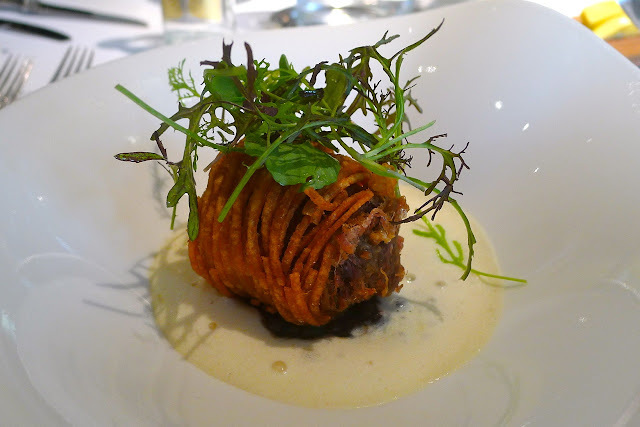 My father and I both chose the Potato Wrapped Cockerham Goat, served with Lentils and a Smoked Bacon Foam. Chefs Nigel and Lisa are not usually associated with culinary foams but already we had had one on the amuse (the onion mousse), the starter (the curry) and now with the Smoked Bacon, each of them though added a interesting burst of flavour and were not just there for show or to be ‘trendy’. 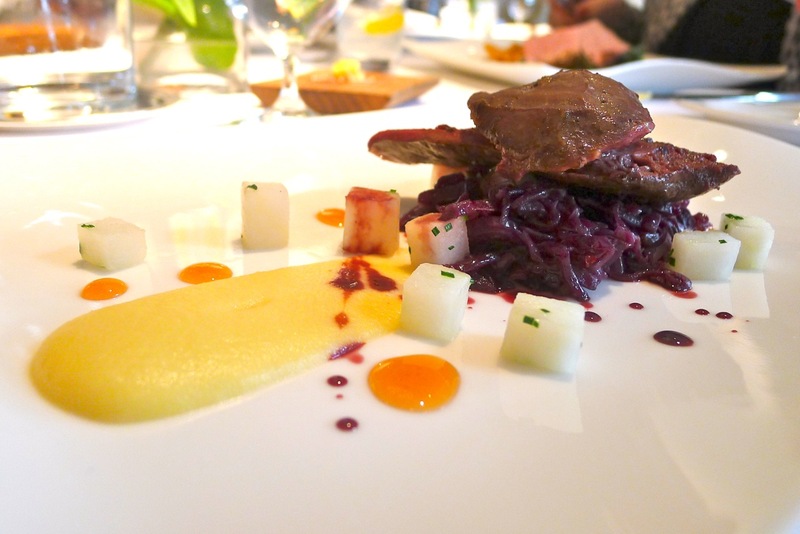 The goat itself was exceptional, so full of flavour and the crispy potato wrapping was perfect – very accomplished cookery. 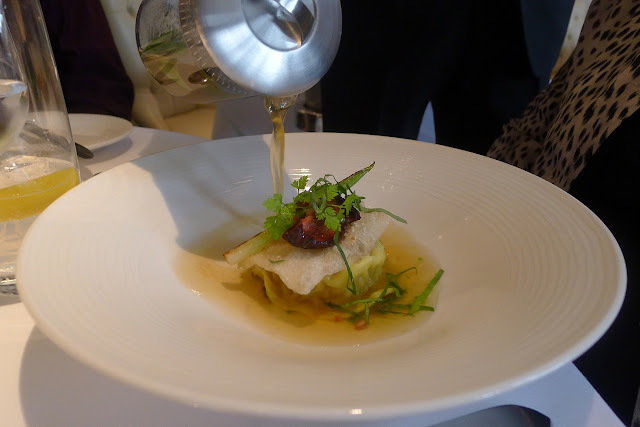 My mother chose the Loose Birds Free Range Chicken Ravioli with Dried Plums and Basil - the consommé looked wonderfully clear. 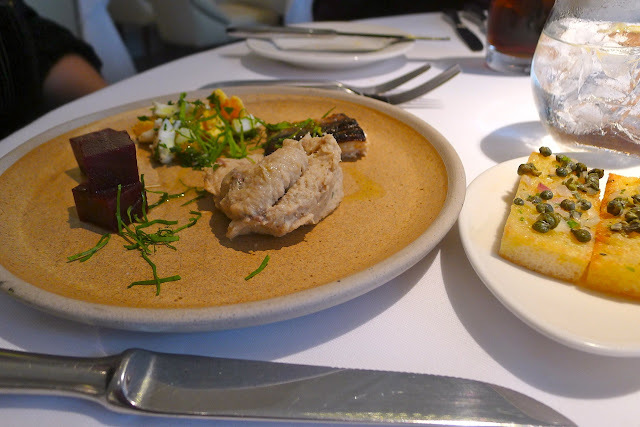 My wife opted for the Smoked Mackerel Pate with a Soft Hen’s Egg, Warm Toast and Sorrel. I managed to pinch one of the accompanying caper toasts – delightful! 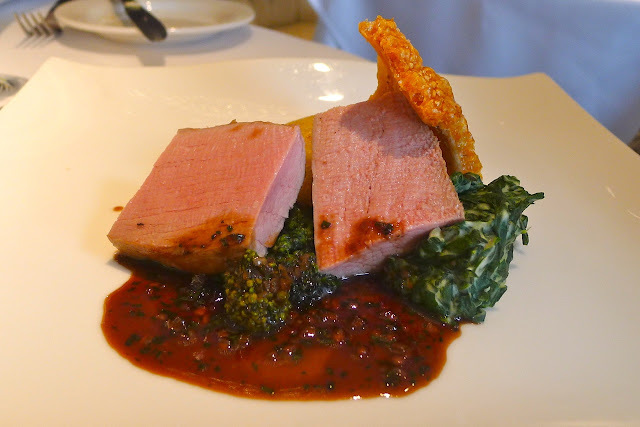 I am undecided whether the best pork I have ever tasted was at Le Gavroche (see here) or during a previous visit to Northcote, as a result of my recommendation, my mother and father both chose the Gloucester Old Spot Pork Fillet. 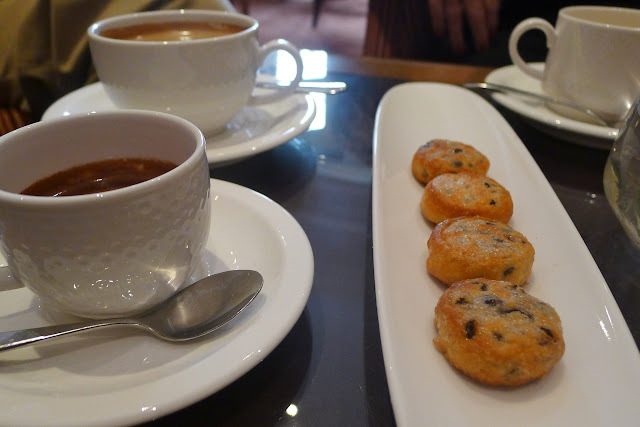 Served with Celeriac and Spinach, Purple Sprouting Broccoli, Caramalised Onion and the Lancashire specialty a ‘Potato Dab’ (a battered potato fritter), they were not disappointed. The crackling was top notch! 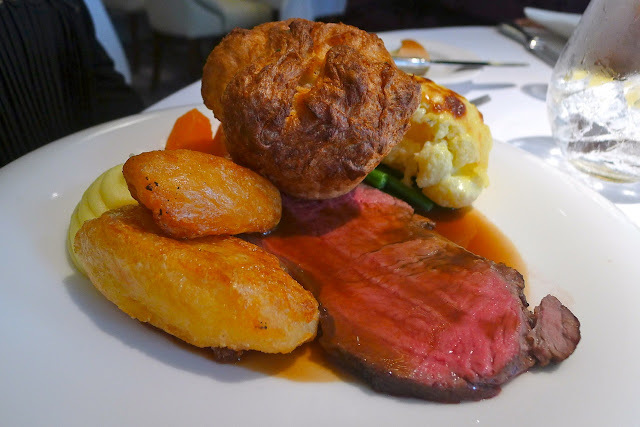 It was a Sunday, so my wife opted for the traditional roast of Roast Sirloin of Dexter Beef with Yorkshire Pudding, Roast and Purée Potatoes, Seasonal Vegetables and Roast Gravy. My wife kindly gave me one of her amazing roast potatoes and some of her beef – it was sublime! 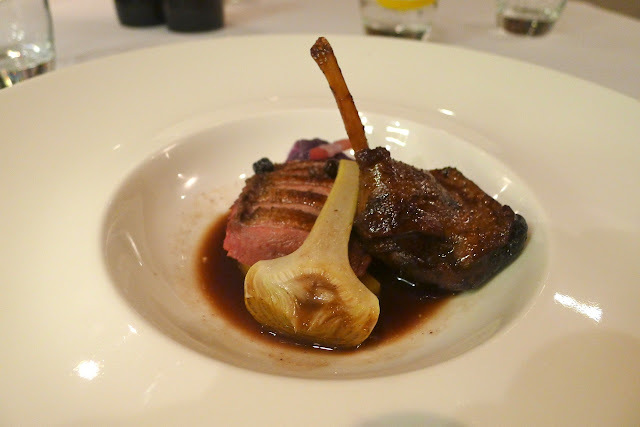 I opted for the Goosnargh Wild Duck with Spicy Red Cabbage, Turnip and Mead. 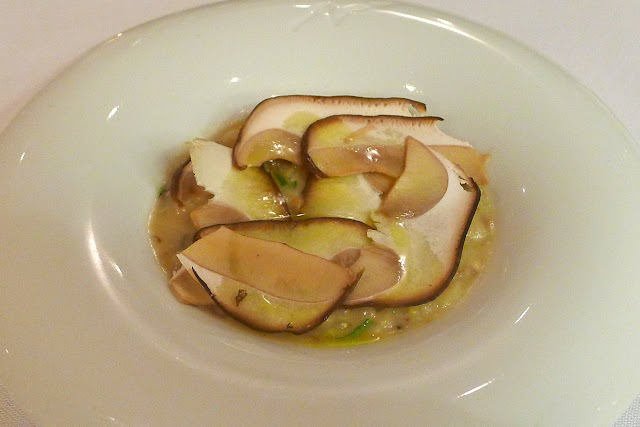 A beautiful dish: the cubes of turnip tasted great and added good texture; the sticky honeyed mead added a sweetness that complemented the rich duck. The four of us each chose a different one of the four available desserts. My wife choosing best with the Bramley Apple Trifle with Sorbet and Crisps - a great combination of flavours and textures, presented with flair. 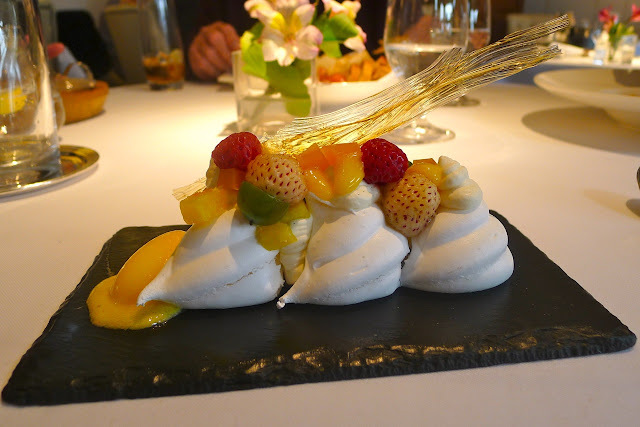 My choice certainly looked the part, a Tropical Fruit Pavlova with Jelly and Double Ice Cream. I’m sorry to say that for me it reminded me of the old adage ‘all fur coat and no knickers’ for it lacked a little in flavour. The sorbet had a reasonable ‘tropicalness’ but I felt it could have done with a coulis or similar for a greater impact; perhaps some passion fruit – but what do I know? 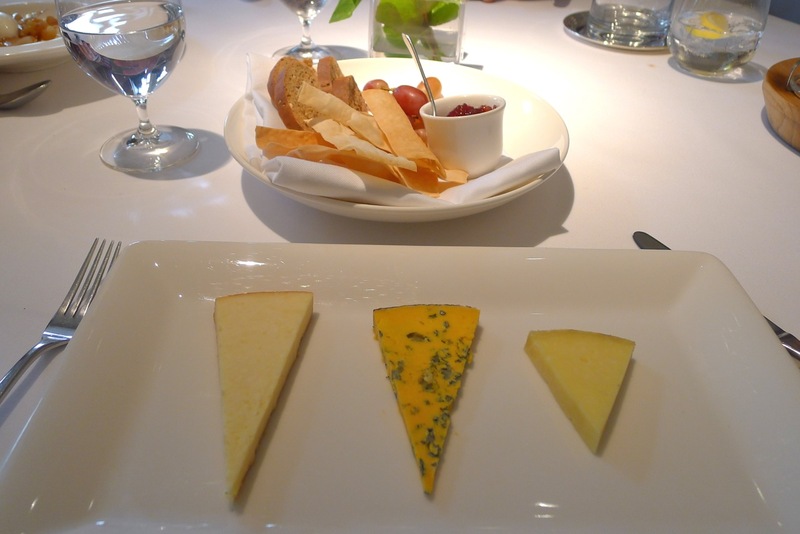 My father went for the Selection of Lancashire and Blue Cheeses – featuring a Mrs. Kirkham's Lancashire, a Smoked cheese and a Blacksticks Blue (named Best Blue Cheese in the World at the Nantwich International Cheese Awards – see here). 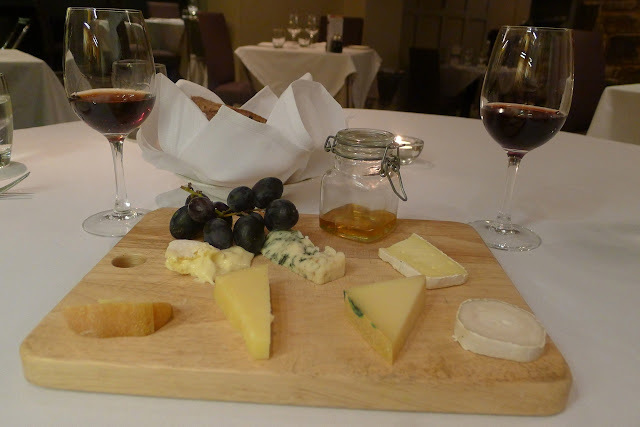 The cheeses were well presented with delicious home made chutneys, breads, crackers and grapes. We decided to take our Fairtrade Triple Certified Espresso Coffee with Eccles Cakes back in the lounge. 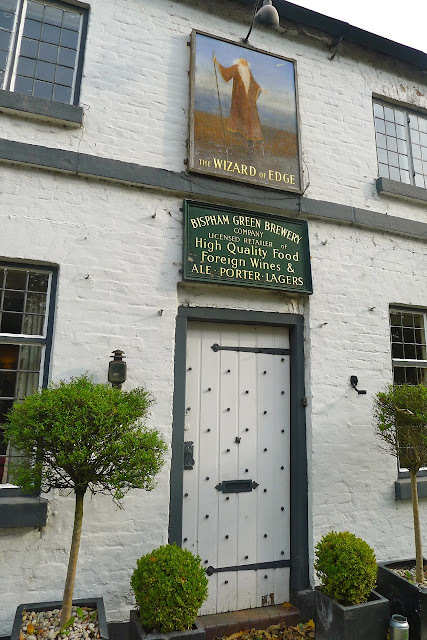 Long before the WAGs arrived in Alderley Edge there were Wizards, or so the local legends tell. King Arthur and his men are said to lie sleeping below the local sandstone cliffs protected by Merlin the Magician. However, it was not footballer’s wives or supernatural sorcerers that I sought on my recent visit – but the hearty seasonal splendour that has won the The Wizard Inn a Michelin ‘Bib Gourmand’ for over ten years! 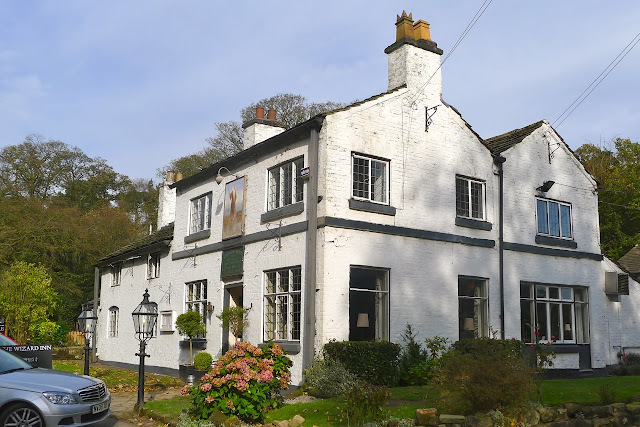 The Wizard is a traditional pub in leafy Nether Alderley, just a couple of minutes from the main shopping street of Alderley Edge and just along from the Alderley Edge Hotel Restaurant (see here). 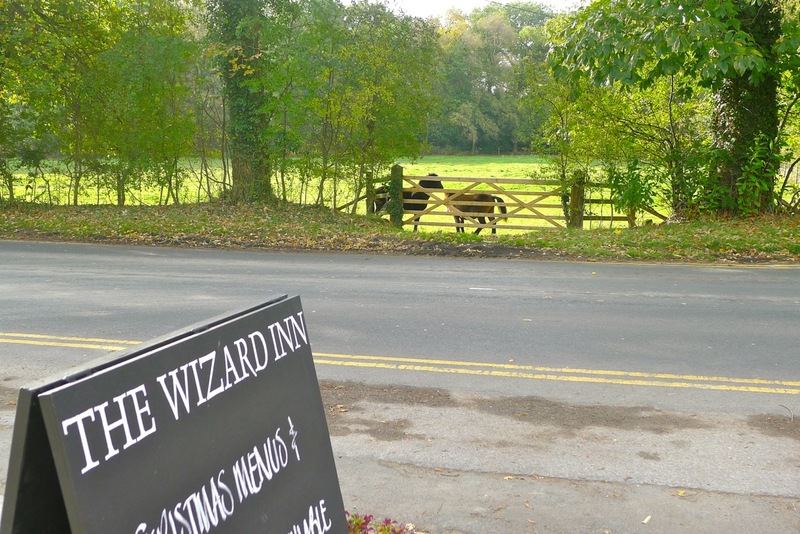 The area is popular with walkers, cyclists and horsey folk; the neighbouring Wizard Tea Rooms catering for those with especially muddy feet and particularly wet dogs. Housed in a quaint white painted building that dates back over 200 years, the pub with its low, beamed ceilings, heavy rustic furniture and open fires couldn’t be more full of character. 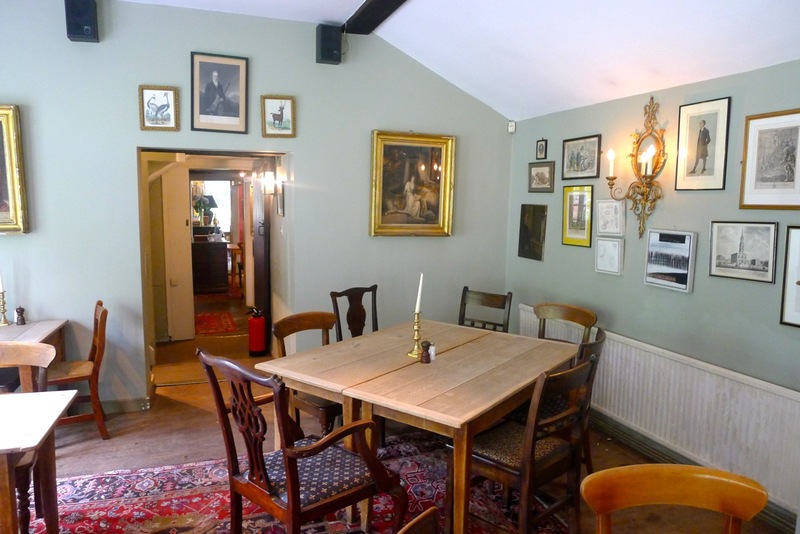 The walls are adorned with an abundance of pictures; purposefully placed artfully askew? Despite its age the Wizard is well lit, the leaded windows and French doors opening onto the gardens and surrounding Wizard Wood. Over the road, ponies wait patiently to be petted by passing children, out for the day for their family’s fix of country good air. 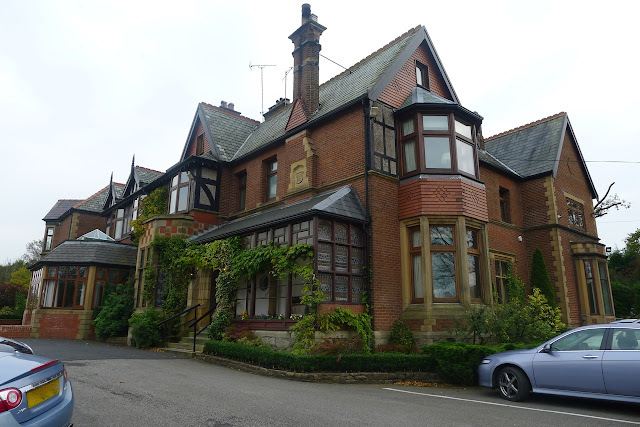 My parents, who were visiting from Spain, really loved the ‘Britishness’ of the place, which is something that they miss in their rural setting. 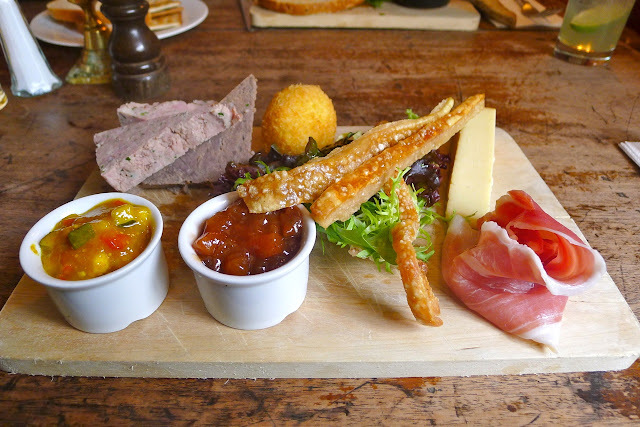 The menu serves a mix of traditional British pub favourites and Mediterranean influenced dishes; the ‘Salad of warm Chorizo, sun dried tomatoes & olives with red pepper pesto’ and the ‘Wizard Tortilla Chips, Guacamole, Chilli & Lime Houmous & Sour Cream’ being two such examples. 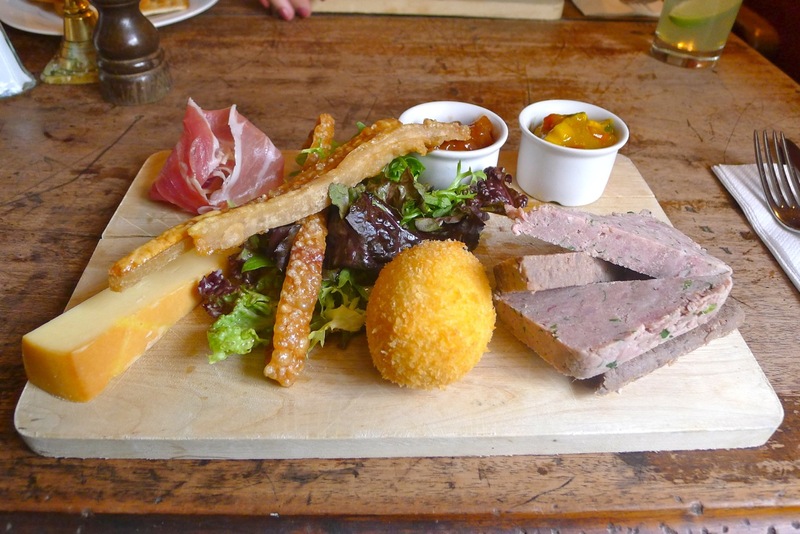 Closer to home, ‘Cheshire Pork T-Bone’, ‘Rod Spence Ribeye’ and ‘Greaves of Upholland Beef & Wholegrain Mustard Bangers’ speak of their commitment to quality local produce. Unable to resist the temptation of a triple cooked chip, I chose the Wizard Fish & Chips. 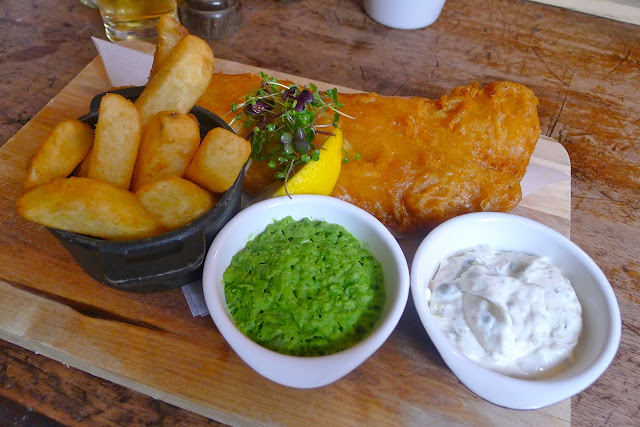 Quirkily served on-board a board the day’s ‘Market Fish’ happened to be haddock – it was well cooked with a crunchy golden batter. 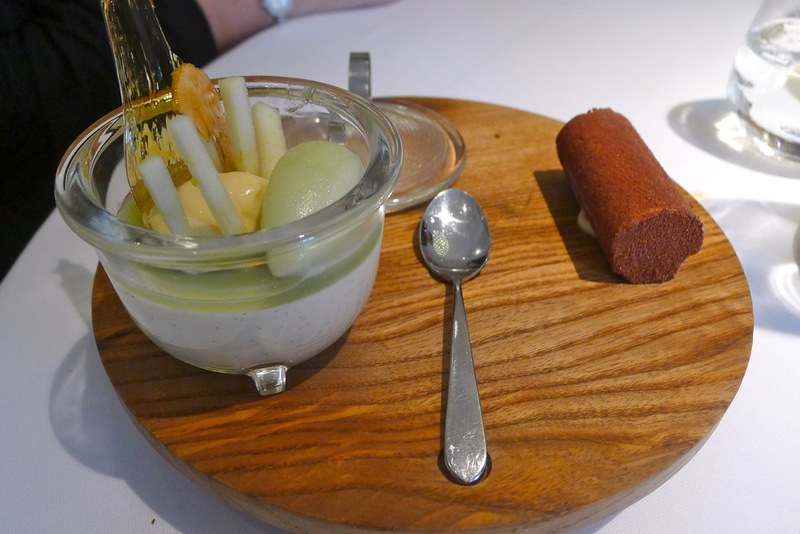 The ‘Homemade Tartare Sauce’ and ‘Minted Mushy Peas’ were perfect accompaniments. The ‘Triple Cooked Beef Dripping Chips’ did not disappoint, although I would’ve liked a few more! As suspected, the chips that came with the fish were simply not enough to satisfy my greedy gut, so when I noticed Posh Chips on the menu I could not, not try them! 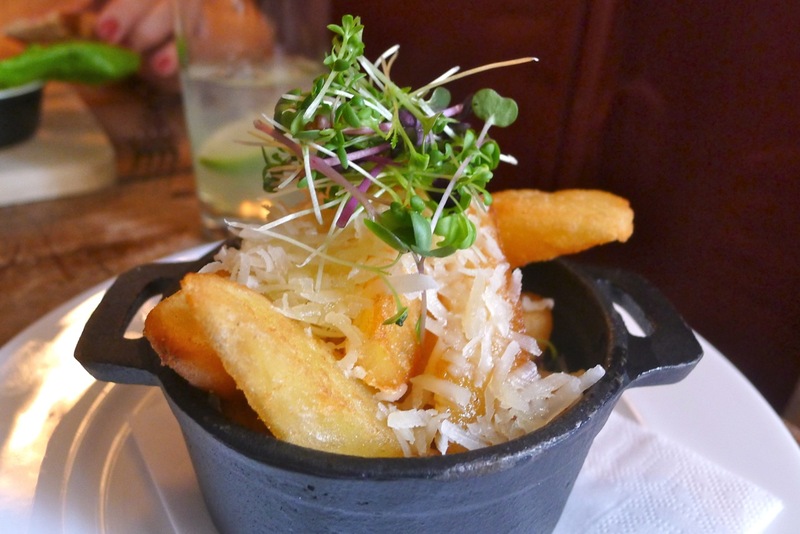 So what makes a chip ‘Posh’? Try triple cooking them in beef dripping and then topping with White Truffle and Parmesan! Yes… they were as good as they sound! We also ordered a Fish Platter. 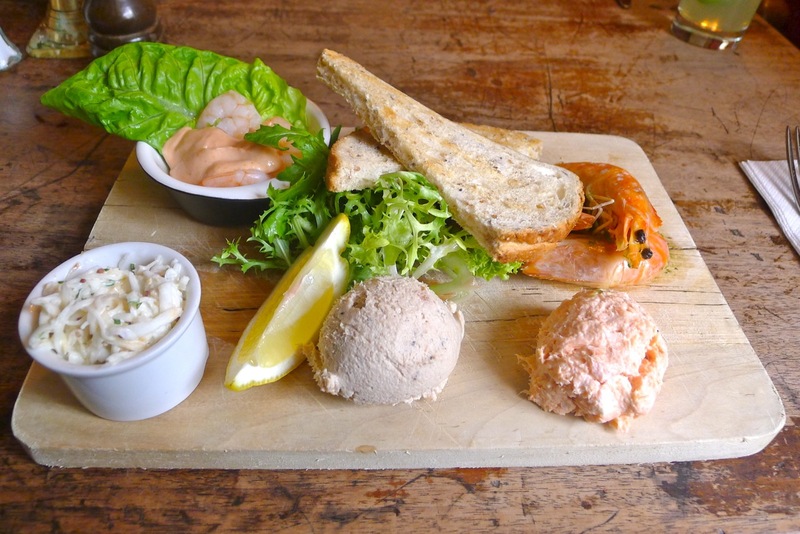 Which the menu states includes King Prawn Cocktail, Peppered Mackerel Pate, Loch Tay Rainbow Trout, Crevettes, Cod Fish Fingers, Celeriac Slaw & Multi Seeded Bloomer – it’s only now looking at the photo that I notice our platter lacked the promised Cod Fish Finger! Not to worry, it wasn’t missed at the time. Everything was fresh and tasty - my favourite being the deliciously peppery mackerel paté. To go with our fish we also ordered the Butcher’s Platter, complete with Rustic Ham Rillette, Sandhams Smoked Lancashire Cheese, Lancashire Air Dried Ham, Potted Beef Featherblade, Deep Fried Soft Hen’s Egg, Crackling, Piccalilli, Spiced Pear Chutney, Warm Bread & Biscuits. Again, everything on the board was high quality and well prepared. For me, the best parts of the Butcher’s Platter were the ‘Deep Fried Soft Hen’s Egg’ and the ‘Piccalilli’ - the soft buttery yolk perfectly encased in a crunchy breadcrumb shell; the piquant piccalilli probably the best I have tasted! 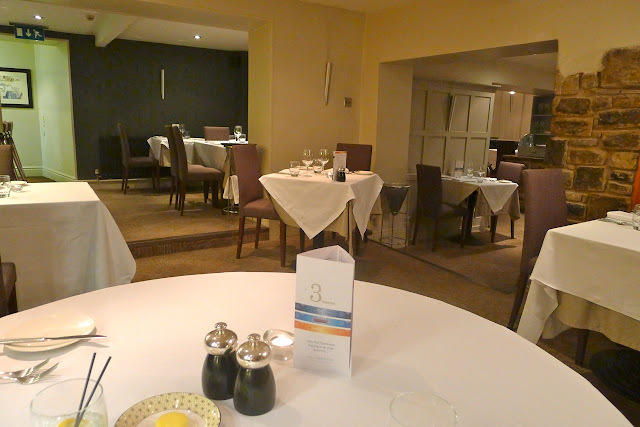 A magnificent meal and a wonderful place to have so locally – I can’t believe we have not been before! 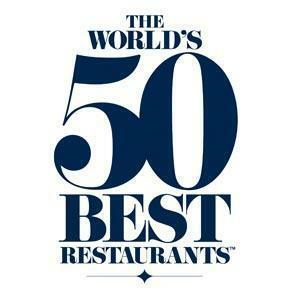 Made all the better by the excellent value for money as recognised by the Michelin Bib Gourmand Award. During the summer my wife and I spent two weeks visiting my parents in Spain. This week my parents came to stay with us and to keep them entertained we planned a few days out (and a lot of great meals.) 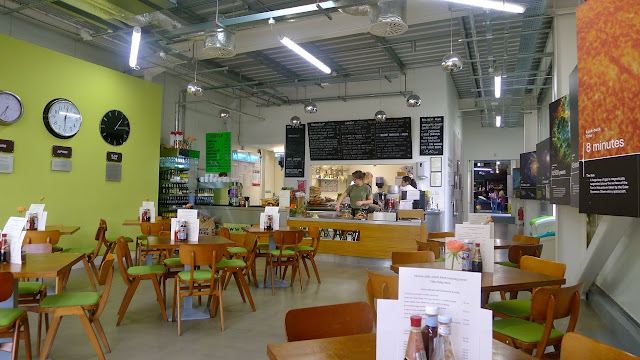 When my dad said that he wanted to visit the nearby Jodrell Bank Centre for Astrophysics I took the opportunity to kill two birds with one stone and check out the newly opened Planet Pavilion Café. The Planet Pavilion along with the Gallery Café at the Whitworth Art Gallery (see here), Gabriel’s Grocery and the IABF, is an outpost of The Modern Caterer. 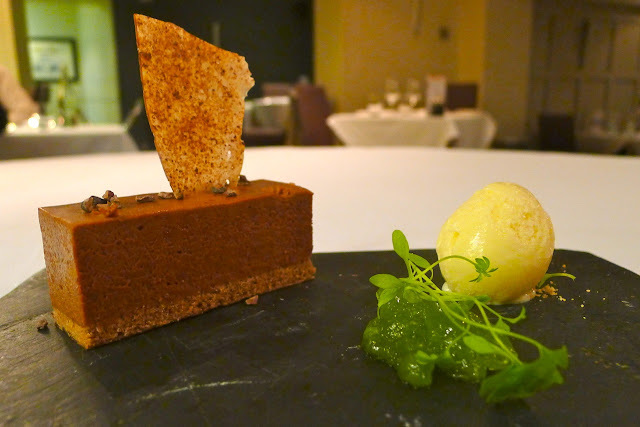 Started in 2005 by chef Peter Booth, a onetime winner of the Manchester Food and Drink Festival’s ‘Food Hero of The Year’ award, the Modern Caterer has developed a reputation for wholesome, healthy, seasonal, sustainable and tasty food. Personally, I’d like to get on with telling you what I ate but in case you are interested (Whatever launches yer rocket! ), here’s a little bit of information about Jodrell Bank. 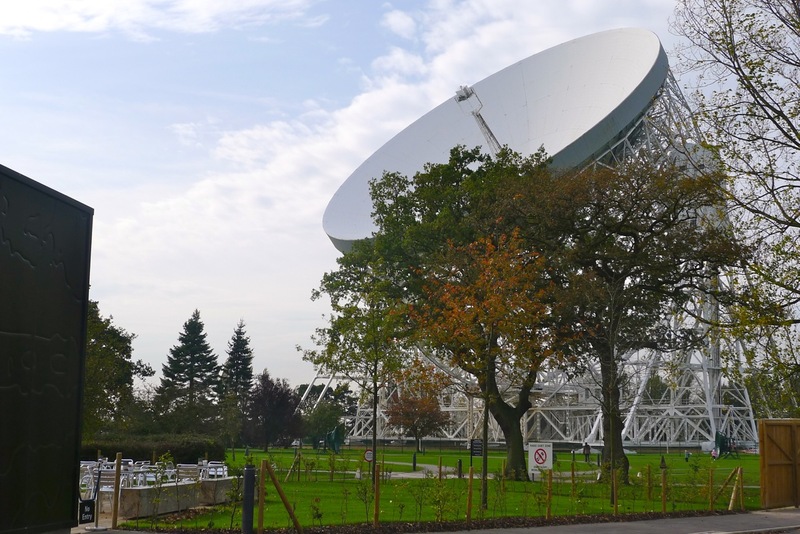 Home to the Grade I listed landmark 'The Lovell Telescope', Jodrell Bank has been the site of an observatory since 1945. 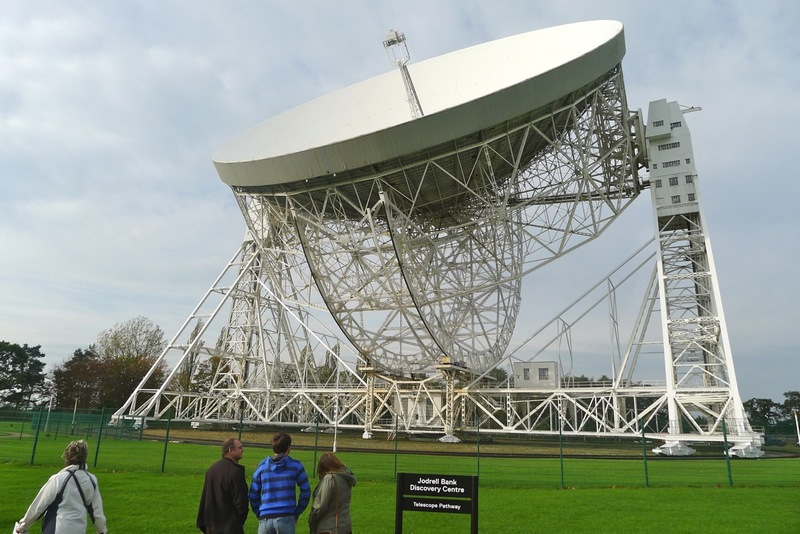 It is the third largest steerable radio telescope in the world and is named after the station’s founder, Sir Bernard Lovell. The telescope became fully operational in 1957 and coincided with the USSR’s launch of Sputnik 1 - the world’s first artificial satellite. At the time it was the only device capable of tracking Sputnik’s progress. In 1966 it also tracked the unmanned moon lander Luna 9 and listened in on its transmission of photographs from the moon's surface, which were subsequently given to the British press and ‘published before the Soviets themselves had made the photos public’ – they can’t have been pleased! As well as tracking satellites and probes, the Jodrell Bank telescopes help the likes of Professor Brian Cox to study ‘things’ such as pulsars, quasars and neutron stars – you can tell that I learned “loads!” Actually, I learnt more than I am letting on; the Space Pavilion was full of interesting interactive exhibits and videos, answering many questions about the Universe. The children who were visiting on the day certainly seemed to be enjoying themselves. 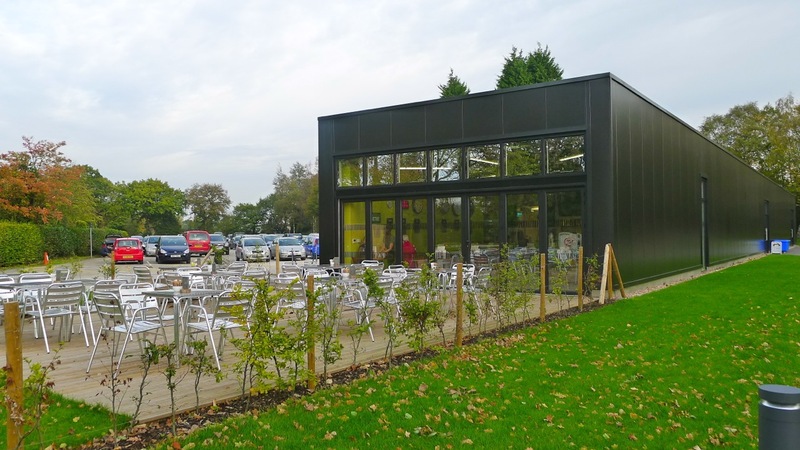 The café itself, housed in the Planet Pavilion with great views of the Lovell Telescope was also a great place to learn as well as lunch. 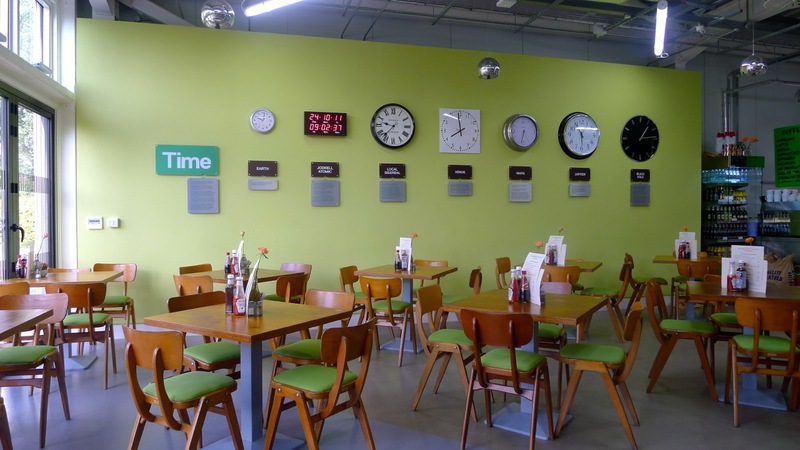 One wall of the café displays the time on Earth, Venus, Mars and Jupiter and also tells of Jodrell Atomic, Local Sidereal and even how time works in Black Holes – not many cafés do that! 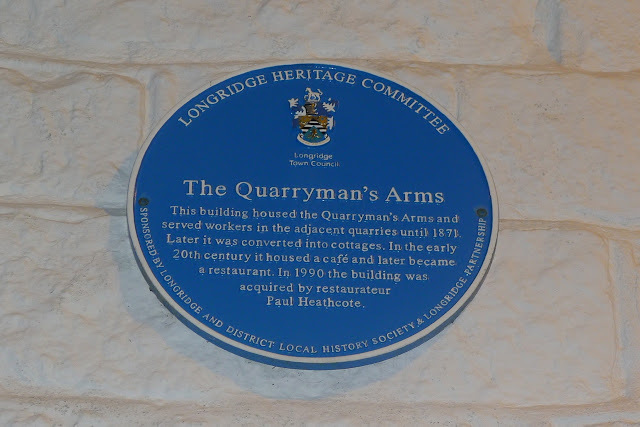 Most people would find the views of the grounds and imposing telescope to be the most interesting part of a visit but for me the views of the chalk boards displaying the menu and daily specials were more my thing. Dishes such as ‘Potted Cheshire Pork, English Apple Jelly and 100% Rye Bread’ sounding much ‘hotter’ than the surface of the sun! 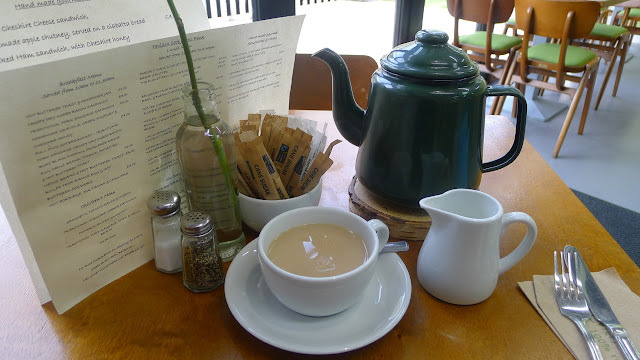 We had arrived at the 10am opening time, so instead of the pork I decided to go for the Full English Breakfast and a Pot of Tea. 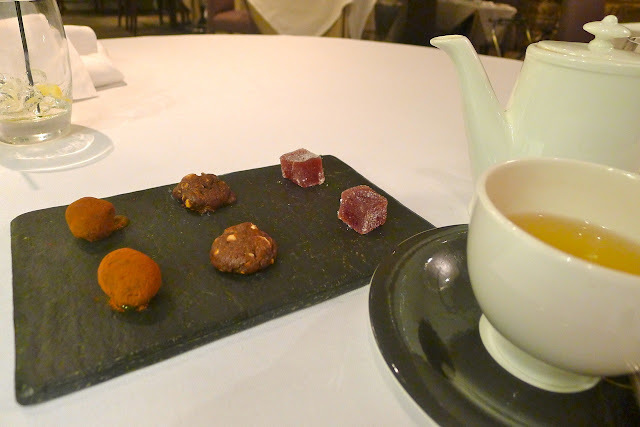 The tea was served in a funky retro enameled teapot (with Fairtrade sugar.) The staff were all very friendly. 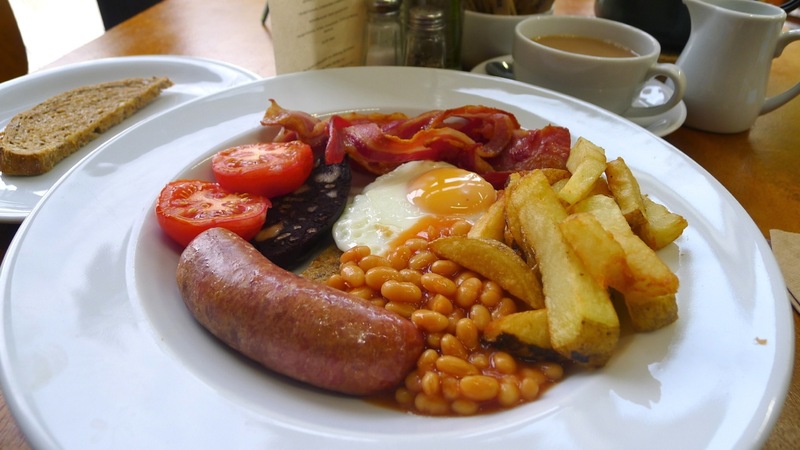 My ‘Full English’ featured, in alphabetical order: Bacon, Beans, Black Pudding, Chips, Egg, Sausage, Toast and Tomato. Everything was of a good quality, lightly cooked and not at all greasy. 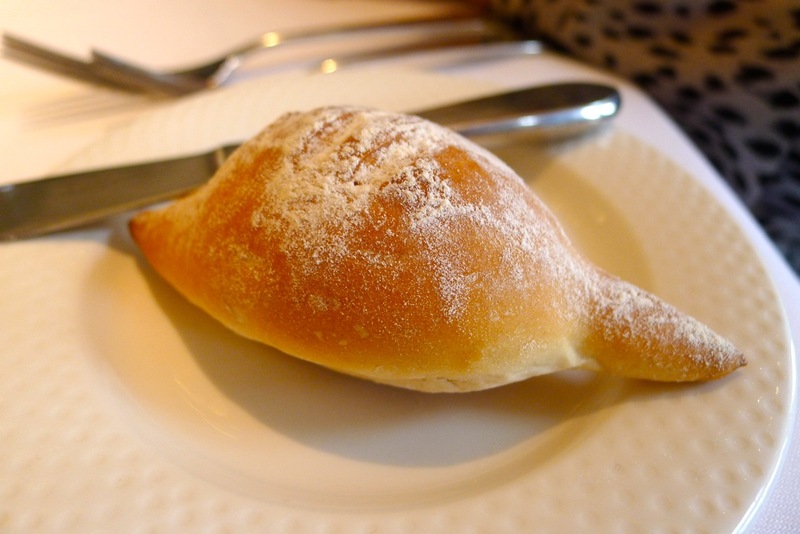 The award winning Barbakan Delicatessen provided the bread. It’s a long time since I have eaten a large cooked breakfast like this – I had forgotten how good dunking a crisp fluffy chip into a deliciously runny yolk could be! So what did I learn? 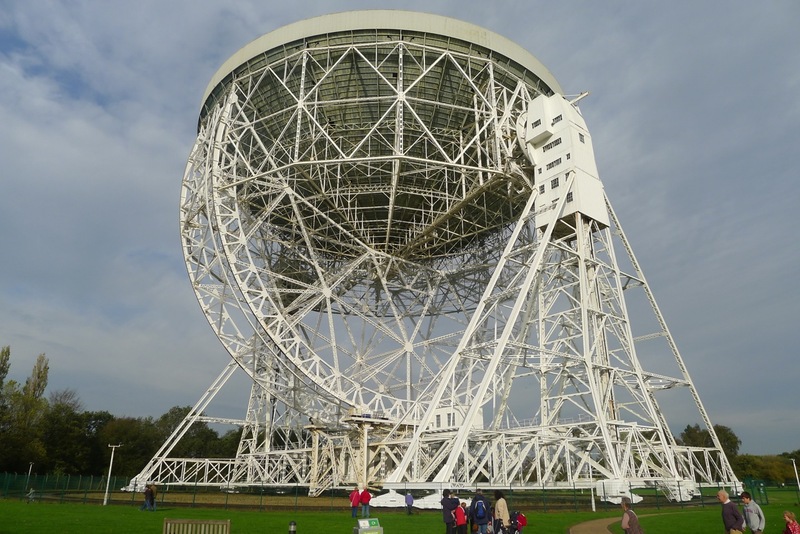 I learnt the history of the impressive Lovell Telescope; I learnt that the Universe is expanding and I learnt that the Pavilion Café does excellent cooked breakfasts! 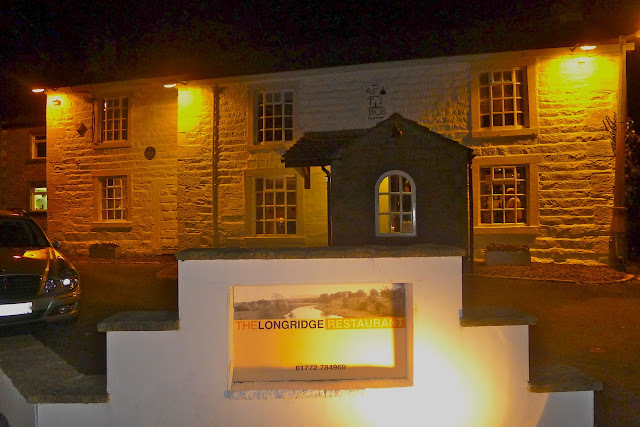 ‘Paul Heathcote MBE regains two Michelin Stars at his flagship Longridge Restaurant’ – this is a headline that myself, fellow North West foodies and I am sure Paul, would love to see! 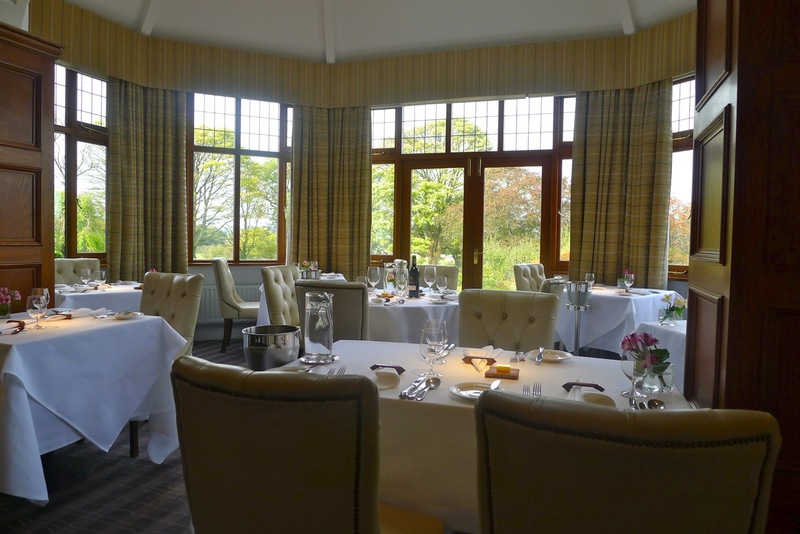 Having trained and worked at some of the countries’ best restaurants, namely Sharrow Bay, The Connaught and for twelve years at Le Manoir aux Quats’ Saisons Paul returned to his native Lancashire to open The Longridge in 1990. 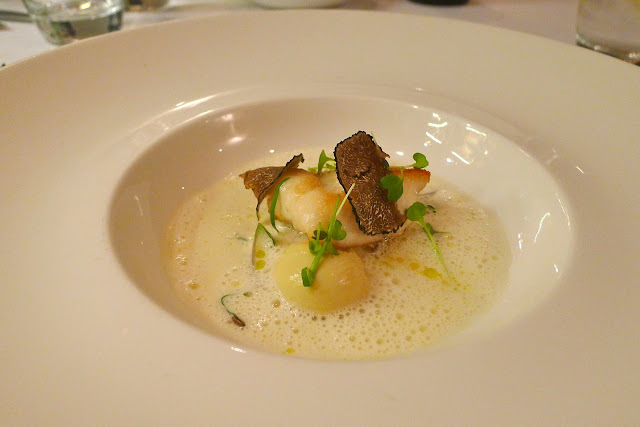 Just two years later he was awarded his first Michelin star his second following soon after. 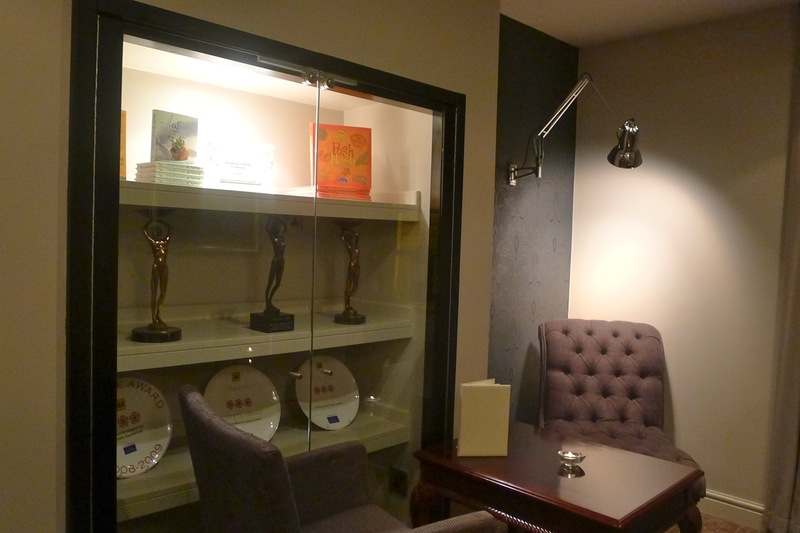 The Longridge Reception displaying Paul's Books, Cateys and AA Awards. The Longridge kept the two stars for four years and last held a star in 2006. These years marked the golden years for Heathcote. Throughout his hugely successful career Paul has published two best selling books, taught children about healthy eating, opened (and closed) a number of restaurants and won a plethora of awards and accolades, including Egon Ronay Chef of the Year and three Cateys! His crowning glory, receiving his MBE from Buckingham Place in the 2009 Queen’s Birthday Honours List. In his quest to regain Michelin star status, Paul’s ambitions are reflected through his Head Chef appointments. Since the talented Chris Bell (who you may recognise from TV’s Great British Menu) left earlier this year to return to his native Northern Ireland, Heathcote has appointed Hywel Griffith to run his prized kitchen. Hywel, fresh from working at Michelin-starred Ynyshir Hall Hotel in Wales, is another young chef aiming to make his mark on The Longridge and give the guide’s judges what they are looking for; most notably: 1) quality of ingredients; 2) skill in their preparation and the combination of flavours; 3) level of creativity; 4) value for money and 5) consistency of culinary standards. Nor have we received ‘six months' training and work with an experienced inspector before going it alone.’ By many standards we eat out a lot (typically two or three times a week) but Michelin inspectors are said to evaluate 240 restaurants a year! However, like I say, qualified or not, it’s natural to make comparisons and subsequently I’ll pass comment on each dish from our recent meal of The Longridge’s Gourmet Dinner Menu, using Michelin’s five criteria. After a horrendous journey in which we encountered two seperate traffic jams, we arrived (after ‘phoning ahead to inform the restaurant) an hour late. 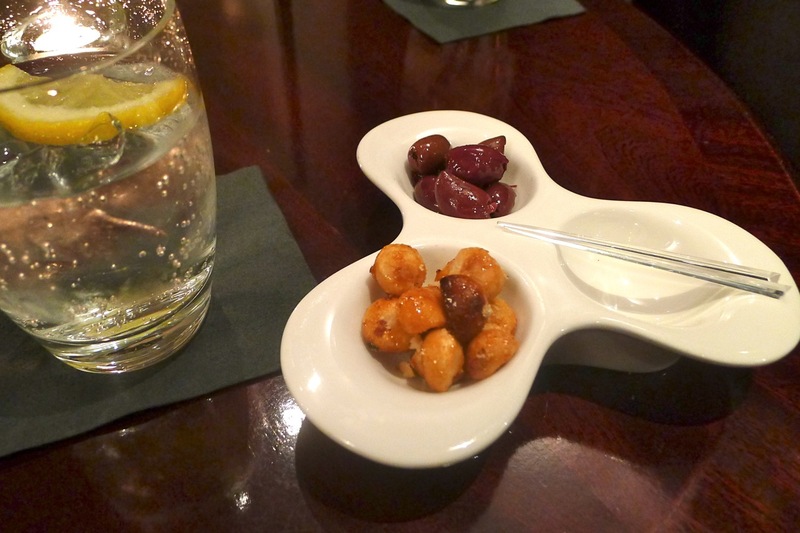 We were warmly welcomed and began to relax with an aperitif and some olive and macadamia nut nibbles in The Longridge’s comfortable reception area. First impressions were certainly very positive, the décor charmingly fusing the old and the new; the restaurant’s ‘blue plaque’ outlines some of its history. Of all the criteria, I assume the most subjective has to be the ‘level of creativity’ and then to a lesser extent the ‘combination of flavours’. Of course it’s also difficult to comment on ‘consistency’ after one visit. The easiest of the criteria is probably ‘value for money’ and I feel that The Longridge certainly offers that, especially with the regular offers that can be accessed through the website when you sign up to become a ‘Friend of Paul’. Like I say, I’m not really qualified to judge but my views do seem to agree with Michelin’s, in that they have not yet returned the restaurant’s star status. I sincerely hope that I’ll be reading that headline soon and I’m sure that the one person who knows better than me what The Longridge needs to do to win back a star is Paul Heathcote MBE.